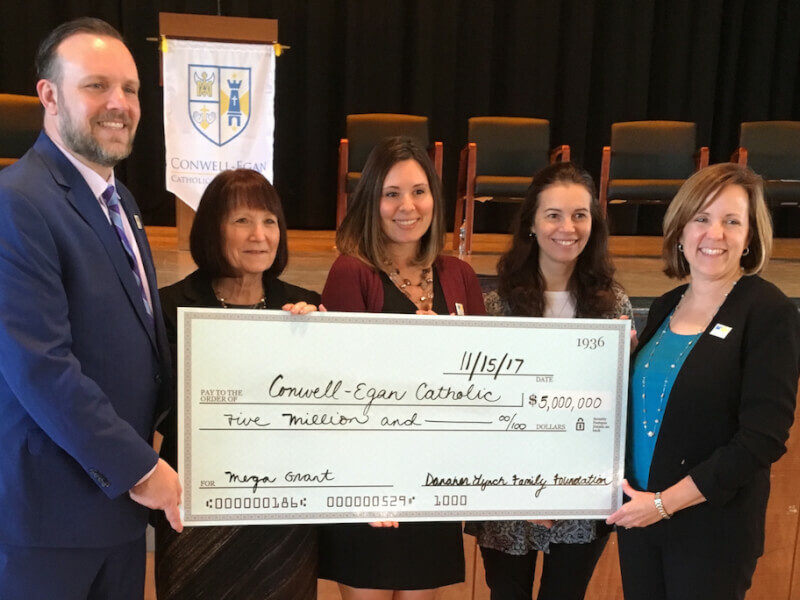 On Wednesday, November 15, Conwell-Egan Catholic High School announced a historic $5 Million gift from the Danaher Lynch Family Foundation. "We feel strongly about the school and its importance in the network of schools in lower Bucks County," said Lynch, the former CEO of TE Connectivity, a Berwyn-based multinational manufacturer of electrical connectors. Lynch, who is now executive chairman of the company's board of directors, also heads the Conwell-Egan board. Lynch graduated in 1972 from Bishop Egan High School when it was a boys' school. His wife earned her high school diploma the same year from Bishop Conwell, a girls' school in Levittown. The schools merged in 1993. The foundation funds will be used to provide additional scholarships, make capital improvements to the building, and create a Center for Student Leadership at the school, which has 495 students this fall. "From a historical standpoint, it matches the biggest gift ever given to a Catholic high school" in the Archdiocese of Philadelphia, said Daniel Lodise, Conwell-Egan's president. "It's going to have a pretty profound effect on the school." "This is a transformative moment for Conwell-Egan," said Christopher Mominey, chief operating officer and secretary for secondary education in the archdiocese's Office of Catholic Education. "It's indicative of the success the school has had and intends to have over the next several years." The size of the Lynch foundation gift equals what had been the largest alumni donation to one of the 17 Catholic high schools in the five-county archdiocese. The Lynches established their family foundation in 2013 to provide scholarships to help students who attend CEC. The $2,000 annual scholarships are renewable for four years. CEC has 53 DLFF scholarship recipients this fall. "We could see the opportunity there to make the school even better than it was," Lynch said. "It became a labor of love." Click here to watch video of today's press conference. Visit our Facebook page to check out news, photos, and video from today and see what's happening at CEC!